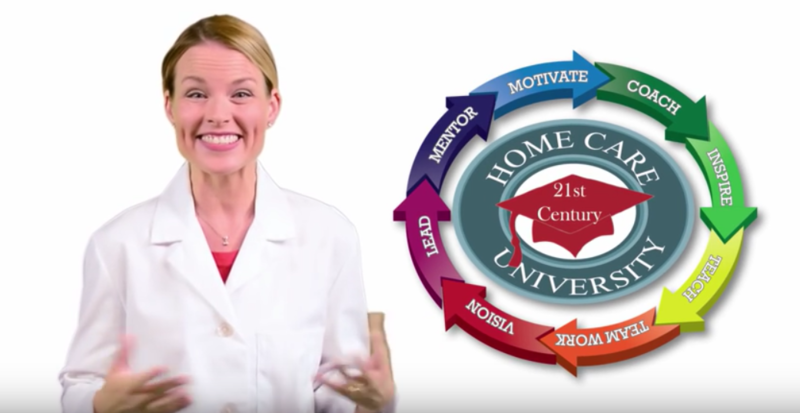 Welcome to Home Care University! We provide lifetime Home Care Training for Home Health Care, Personal Care, Companion Care and Hospice Agencies. We offer specialty programs in the areas of Infusion Therapy services, Wound Care services and Pediatric Home Health Care. We offer four and five days of live home care training that are held every quarter. All of our Home Care training programs are available to all of our clients on an ongoing basis. We offer a lifetime training resource opportunity for our agencies. This means as your agency grows or there is a need to replace key personnel, you can send them to Home Care University free of charge. One word describes our Home Health Care Training Seminars…Intense! After attending our live Home Health Care Training Seminar, you will receive all the necessary tools needed for your Home Health Care Agency to succeed. We will teach you to develop and implement specialty programs that include Fall Prevention & Safety, Low Vision, Alzheimer’s Care, Transitional Care, Memory Care Programs and ICD 10 Coding. We will provide you with all of the materials and training necessary to implement each program. Our home care training seminars are held every quarter. administrative operations, human resources, hiring protocols, HIPAA, branding, marketing and how to get patient referrals. We offer four and five days of live home health care seminars that are held every quarter. Call us at 888-850-6932 to Register! GIVE YOUR COMPETITION THE BOOT! Kick-start your home care business with our boot camp training seminar. Get ALL the Tools you Need to Succeed in ONE POWERFUL PROGRAM! Our home care training seminars can be summed up in one word…INTENSE! After attending our live training program, you’ll be ready to hit the ground running for success. We’re the ONLY Company that Teaches you the Nuts and Bolts of building a Strong home care business foundation. The highlight of the boot camp was the group breakout exercises. I really enjoyed myself. I came to boot camp with reserve but upon arriving we were welcomed with a wonderful spirit and open arms. They also made us feel like family and that makes a big difference for me. I learned at the training to keep smiling, to never give up and be humble. I recommend this training program to anyone who wants to open a home care agency. It is instrumental for anyone who is involved in running an agency. The 21st Century boot camp was very informative. Not only will they teach you how to run a Home Care Agency but they will teach you invaluable life skills. The boot camp was great! More than I expected. Everyone that I spoke with was very informative! Besides all the material covered in the last 5 days the highlight of this training program has been the direct conversations I have had with staff and partners such as Teresa Harbor from the Accreditation Commission for Health Care (ACHC), Lynn Lambarta from Medicare Billing and Rhonda/Becky from the 21st Century team. The first hand information was invaluable. The 21st Century team has been so friendly and willing to provide the time I needed to understand the information. We have a unique company setup (PEDS) and we appreciate 21st Century partnering with us to help figure out our unique marketing approach. All of the topics of this training program are relevant and extremely necessary to have a successful home care agency. Attending the boot camp made me witness first hand the culture the 21st Century team has. They are a close knit second family. They are serious about their business and responsibilities that they have to their clients. I also wanted to mention that our coach/account manager Annalise has been awesome from the get go, patiently guiding us through all the steps of the way. I loved it!. Wonderful people, servant / leaders, well informed and ready to assist you in every area of your business. I would come again. We are very glad we came because it was money well spent in helping us sort and navigate our course of direction in getting our home health running. It was awesome, very informative, good networking and good vendors. I would like to thank all of the staff at 21st Century for welcoming me into their home with tremendous knowledge, smiles, and being compassionate. Thank you very much. Training was a beautiful experience I had with 21st Century. I would like to say thank you for everything. My experience with 21st Century team has been great. They are very reliable, very understanding and very proficient. If you attend their training programs as I have done, you will not be disappointed. The highlight of this training program for me was the documentation, billing, and marketing presentations. You can’t do most of the things that 21st Century offers you by yourself. My experience in working with them is that you will save money, time and headaches. I’m so glad I didn’t open my own home care agency on my own. We provide lifetime Non-Skilled Home Care Training for Personal Care and Companion Care Agencies. Home Health Care Training is provided for Medicare and Private Duty Agencies and Home Hospice Training for Hospice Agencies. We offer specialty programs in the areas of Infusion Therapy services, Wound Care services and Pediatric Home Health Care. We also offer a Quality Outcomes Advanced Training program for all of our operational agencies. Copyright©HomeCareUniversity.net 2017-2018. All Rights Reseved.